Blind Cleaning is tricky if you are not calling a professional and choosing to do it all on your own. Generally, people remove their blinds from the windows and put them in the bathtub to clean blinds. But what if you want to get your blinds cleaned and not have a bathtub at home? Read on as we are going to tell you just how you can do that. We will give you two ways to clean blinds at home: Dry Blind Cleaning and Wet Blind Cleaning. In other words, the former blind cleaning methods use water and the latter does not. Without removing the blinds from the window, flip them vertically so you can see either of the two sides completely. Put a newspaper at the floor, to collect all the dust that falls off the blinds. Get a microfiber dust cloth or a static cloth to wipe off the dust from the surface of the binds. Use a vacuum cleaner with a crevice tool attachment to clean dust from the hard to reach areas. Clean off the window sill and the floor. Flip the blinds vertically as mentioned above in Step 1, put papers on the window sill and the floor. Clean as much dust possible with a vacuum cleaner or cloth. Get two buckets ready, one with warm water and soap and another with plain clean water. 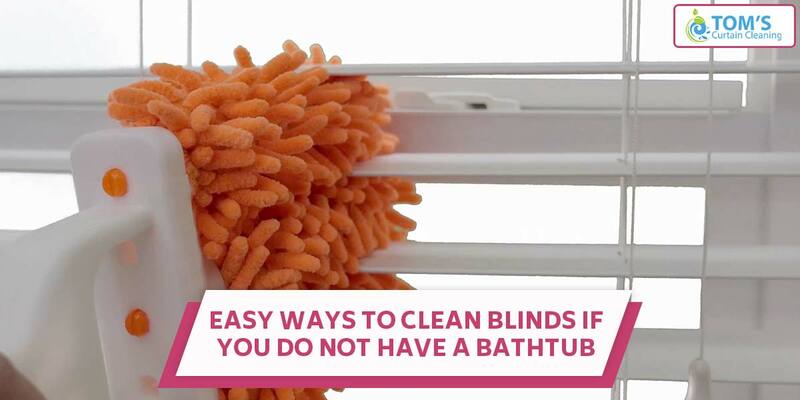 Dip a piece of sponge in soapy water and start cleaning the blinds from top to bottom. Go one blind at a time. After washing them with soap, dip a different sponge in clean water and wipe the blind. Dry it with a clean cotton cloth. Continue this method until the last blind. Clean and wipe the window sill and floor. If you are not choosing to indulge with blind cleaning hassle, you can contact a blind cleaning professional. To get your blinds as good as new call Toms Curtain Cleaning – Melbourne service providers on 1300 068 194. You can get a free consultation by Toms Curtain Cleaning Melbourne. Our services are also same-day and on-site curtain with 100% organic cleaning products.